Solid surface bits are made by Amana Tool, the leading manufacturers of high quality wood cutting tools. 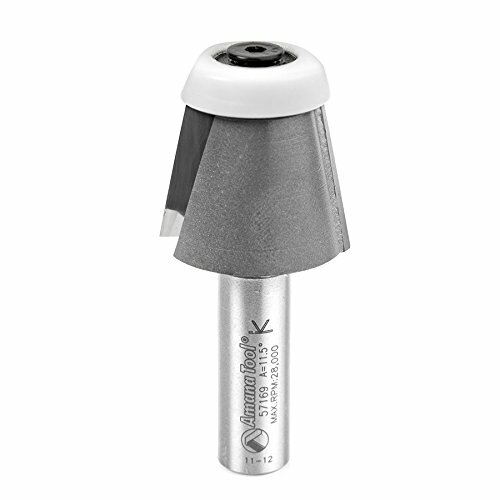 Amana Tool 57169 Carbide Tipped Lansen Solid Surface Edge Sink 11.5 Deg Bevel x 7/8 D x 3/4 CH x 1/2 Inch SHK Router Bit is designed specifically for use for the Lansen Stainless Steel Edge Sink for laminate and 1/2" solid surface materials. Trims the counter-top edge after the bowl is mounted. SPECIFICATIONS: Diameter (D): 1-3/16; Angle (a8): 11.58; Cutting Height (B): 1; Shank (d): 1/2; Overall Length (L): 3-1/8; Type: Bevel; Replacement Bearing: 47733; Screw #: 67146; Flutes: 2; Countertop Thickness: 1/2 & 3/4.